Forgotten Hits On The Radio!!! Phil did an OUTSTANDING job of putting this whole thing together ... MAJOR kudos to him and to WRCO - 100.9 FM in Richland Center, Wisconsin, for allowing us to post the ENTIRE program on our brand new Forgotten Hits Radio Page! Radio's online audience is growing at an impressive pace at a time when the beleaguered radio industry needs all the ears it can get. But radio companies, suffering their third straight year of revenue declines, are having trouble turning that audience into the cash they crave. More than 42 million people each week listen to radio streamed over the Internet, more than double the rate from five years ago, according to market-research firms Edison Research Inc. and Arbitron Inc. Many of those are either new listeners or people tuning in at times when they never listened to regular broadcast radio. This weekend's "Remember Then" Show will feature "Songs of the Night" ... with a lost 45 in the same category as well as the Soul Patrol. Sunday night at 7:00 on fun927.com. We have a new streaming provider so your readers can tune in from anywhere in the world and hear the program. This weekend will be show #401 ... how the time flies (I just featured "How The Time Flies" a few weeks ago as the lost 45 by Jerry Wallace from 1958). Keep up the good work! Before we give you just a brief "teaser" / overview in advance of her upcoming book, here's a recap of what got us here in the first place! Thanks for mentioning Marty Robbins. I've been a fan of his all my life and now I'm his biographer. His songwriting and singing talents were truly amazing, not to mention everything else he could do, such as compete in NASCAR races. I think he'd have many, many, many new fans today if they could hear his music. It's timeless and reaches far beyond country music. I've set a goal of publishing "Twentieth Century Drifter: The Life of Marty Robbins" in 2012. Just as a note, his version of "Singing The Blues" came before the cover by Guy Mitchell. And extremely unusual is the fact that 1960 arrived with "El Paso" in the number one spot on both country and pop Billboard charts. Yeah, Marty! Author of "Live Fast, Love Hard: The Faron Young Story"
After Diane saw Fred's comments, she told me that, although the two had never met, she DID do a radio interview with him at one time, discussing Marty's incredible career. Gunfighter Ballads and Trail Songs, the famous western music album by Marty Robbins, has been on the market for fifty years now. The hit song, "El Paso," held the number one spot on both pop and country music charts as the nation moved from 1959 into 1960. Marty Robbins wrote, recorded and performed hundreds of songs during his three-decade career. His albums usually centered on a specific theme, frequently western songs or country ballads, but also jazz, rockabilly, Hawaiian, pop, gospel, Christmas, Mexican, and West Indian music. Although Marty and his staff wrote most of his songs, he was willing to record any song he liked, regardless of who owned the publishing rights. His number one hits included Gordon Lightfoot's "Ribbon of Darkness," "The Story of My Life" by Hal David and Burt Bacharach, and an old Connie Francis hit, "Among My Souvenirs." He experimented with recording styles as well as with songs. "A White Sport Coat (And a Pink Carnation)" became a smash hit because he brought it to New York City to be shaped by Mitch Miller and Ray Coniff. Marty's "You Gave Me a Mountain" was a hit for Frankie Laine and Elvis Presley. Marty loved performing and was in his element while singing onstage and encouraging audience adulation. The same man who would make silly faces, yell "Don't! Don't stop!" when a crowd applauded, and wave his arms for more applause, was a deeply insecure and private individual. When he played the piano and sang "I Walk Alone" in the recording studio, he thought the producer was ridiculing his piano playing by saying, "It's a hit!" Columbia Records released that first take, and it became a number one record. As his biographer, I've had to really dig to find human flaws. He didn't drink or smoke or cheat on his wife, and he appeared to be universally loved and admired by fans, friends, and employees. His wonderful sense of humor and considerate treatment of others are the comments I usually hear. He was a perfectionist who could sometimes be difficult to work with, and he had a volatile temper that cooled over the years. In addition to music, he was passionate about racing cars. Along with his fulltime performing and publishing careers, he improved his driving skills to move up from micro-midgets to late model sportsman stockcars to competing on the NASCAR circuit. He finished fifth and seventh in races against the Pettys and Allisons and other top drivers. This was after heart bypass surgery. Marty Robbins was 57 years old when his third heart attack took his life on December 8, 1982, six weeks after induction into Country Music Hall of Fame. My publication goal for Twentieth Century Drifter: The Life of Marty Robbins is 2012, the thirtieth anniversary of his death. I welcome hearing from anyone who has information to contribute to the book. Meanwhile, out in the West Texas town of El Paso . . . Marty's music plays on. "El Paso" is an absolute classic ... I can't think of ANY other song that ever evoked such a vivid musical landscape of the old west ... it's no wonder at all that this one reached the top spot on both the Pop and Country Charts. GREAT stuff, Diane ... thank you again SO much for sharing this with our readers! Thanks to our Forgotten Hits Buddy Alan O'Day ... who also just happens to be the composer of the #1 Hit "Angie Baby" ... today we get the OFFICIAL Story Behind The Song ... here's what Alan had in mind when he wrote the Helen Reddy Hit "Angie Baby", #1 in 1974. Three years later Alan would top the charts with his OWN Hit ... "Undercover Angel" ... a track we covered earlier in Forgotten Hits! I would also like to claim that I intended to create “the ultimate Women’s Lib song”, as it was called. But I was only being influenced by the times (including, of course “I Am Woman”), and savoring the triumph of David over Goliath, the insane over the sane, & taking my audience on a dramatic ride. I was not consciously making a political statement, although I’m pleased in retrospect that my heroine was seen as “empowered”. Although this song was never really much of a hit ... despite NUMEROUS recordings by artists who firmly believed that it SHOULD have been ... it CERTAINLY has proven to be popular with our Forgotten Hits Readers. So THIS time we scoured through the archives to put together the DEFINITIVE piece on this long-forgotten classic. Along the way, we'll revisit some of your comments ... and feature a few versions of the song that seem to be amongst your favorites. No need to publish this in your blog ... I was just looking for a little song help. I wondered if you could tell me what issue of Forgotten Hits has the song either titled “She Let’s Her Hair Down When the Sun Comes Up” or “She Goes Walking…” I have been looking for it in old issues and cannot find it. Or, if it is easier just to send the DivShare that would be cool. I think it was within the last month? Seriously – here’s a little song whose claim to fame was helped as the background for a hair color commercial, but I still liked it a lot. I am not even sure if I have it downstairs somewhere in a box! "She Lets Her Hair Down" first saw life as a Breck Shampoo television commercial. 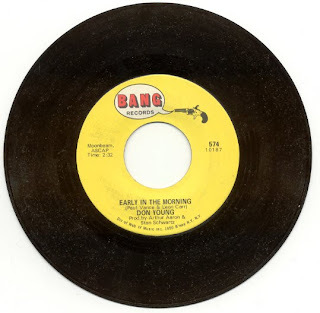 Like "We've Only Just Begun" and "I'd Like To Teach The World To Sing" a few years later, it was expanded to "song length" to be released as a single. Unlike these other two examples, however, it pretty much tanked. Jeff says: The "official" name is "Early in the Morning." It was originally a shampoo commercial, (I found listings for both Breck and Clairol as the originators of this advertising campaign-kk) and many people have done covers, including Gene Pitney. Don's is my favorite. Thanks for The Cuff Links' version of Early in the Morning. I had the album on an 8 track and that was one of my favorite tracks from it. I, of course, can't play the album any more, so I may have to go to the website you mentioned to find it again. I had not realized Gene Pitney had done this song, or if I knew it, I had forgotten. I knew Gene's music all my life, of course, and after his passing, I heard a wonderful tribute and special on Xm radio about him and his music and have such a great respect for him ... he had a fantastic vocal range. Having arranged much of the Cuff Links first album, Rupert replaced vocalist Ron Dante as the "group's" lead voice while continuing to arrange most of the material, primarily written by Paul Vance and Lee Pockriss. I have BOTH Cuff Links LPs on Vinyl. Looks like The Cuff Links' and Rupert Holmes' version of "She Let's Her Hair Down" were released at very much the same time, The Cuff Links' in September of 1969. Oddly enough The Cuff Links' version lists the composers as P. Vance / L. Pockriss & arranged by Rupert Holmes ... and Rupert's version (originally released by The Street People, featuring Rupert, in November of '69, and released on the same label as Gene Pitney, Musicor), lists the composers as P. Vance / R. Holmes & D Jordan. (Produced by Paul Vance). Meanwhile, on the Lyric Website, featuring the Gene Pitney version, it lists the composers as Vance / Carr ... which is correct? In the almighty words of Vinnie Barbarino, "I'M SO CONFUSED"
Hmmm ... did RUPERT maybe write some additional lyrics for The Street People version (and then take a co-writers credit???) I dunno ... but as we continue to let our hair down here in Forgotten Hits (we have now featured an incredible SIX different versions of "She Lets Her Hair Down"!!!) ... it sure would be nice to track this information down once and for all as to who first recorded it ... and who REALLY wrote it!!! I have no doubt that the song was written by just Vance and Pockriss. They are the real deal since their partnership produced many hits including "Itsy Bitsy Yellow Polka Dot Bikini", "Catch a Falling Star" and "Tracy", I think. This song sure got around and used quite a bit I see! 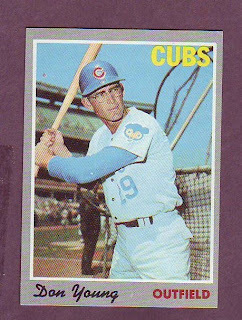 Danny Jordan was Paul's nephew and was in my group, The Detergents, which Vance and Pockiss produced. Actually, now that I've heard ALL of the versions presented so far of She Let's Her Hair Down, I think Rupert Holmes' version was the best. I still have 'She Lets Her Hair Down' in my regular personal rotation. This one should have been a much bigger hit for the group. It's the only record I know of that uses a Slinky as a musical instrument. Listen and hear for yourself. (Careful -- converting and compressing this one may make the slinky's sound too muddy) And we even played Cross Country's 'In The Midnight Hour' in late '73. Loved today's issue. 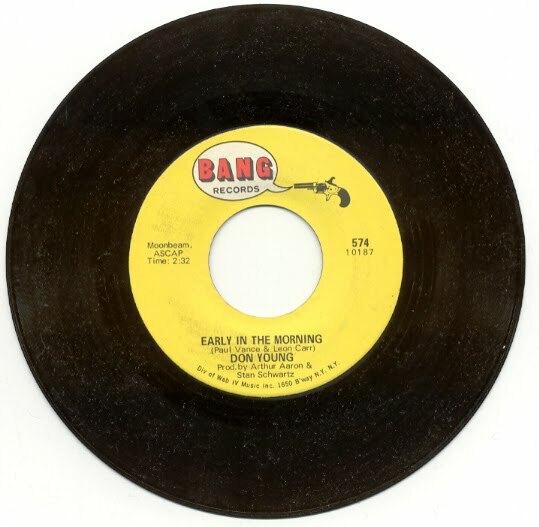 I scanned the 45 of Don Young's "Early In The Morning" cover for your collection. I recorded the song off WCFL onto 8" reel-reel tape when I was a senior in high school in Chicago in 1969. I looked for the 45 for 35 years, and finally found it in a grubby used record shop in Phoenix. It was not in good shape, and then I broke it -- but managed to get a rip done and suppress most of the pops from the fracture line using GoldWave. Thanks for all the hard work on this thing. I can't imagine that you've been doing this for YEARS!!! I have to weigh in on the Tokens' "She Lets Her hair Down". I thought their version was a classic! I was so thinking that THIS would be the song to bring them back to the top of the Billboard charts. Instead it brought them back to the top of the Lincoln, Ne. (?) charts. It reached #5 on KLMS here and followup covers 45s "Don't Worry Baby" and "Both Sides Now" each reached the top 11 here also. I loved their "Don't Worry Baby" then,too. All 1970 charters here. The only song that I recall having two versions appear on the charts at the same time was "Young Love." The battle was between Sonny James and Tab Hunter. This was in the late 50s. I don't know which version charted higher, but I always favored James' version. DANG!!! We are just CHOCK Full of Musical Memories today in Forgotten Hits!!! ENJOY!!!!! I agree much more with your readers' list than his!!! I like our list better than the Billboard List. Only two songs I'm not familiar with: #36 = Soul Coaxing and # 41 = Jessica. Well, the only thing that's missing is "Red River Rock" by Johnny and the Hurricanes, and it's my own fault for not sending my list in. Great choices! And, just in case I haven't said it lately ... thanks for all you do with Forgotten Hits - it's truly amazing! Yes, I found a couple of surprises ... the Ray Anthony version of "Peter Gunn" making the list instead of the Duane Eddy version ... and the Vince Guaraldi version of "Cast Your Fate To The Wind" making the list instead of the Sounds Orchestral version. There are only 6 1/2 songs out of the fifty that are in my golden era of 1964-71; 13% of the songs and 32% of the years. No wonder I don't like many instrumentals! My favorite two "No Matter What Shape" and "Embryonic Journey" probably did not come close. I thank you for the top 50 instrumentals plus all the work you did to collaborate the votes. I noticed that the "Bonanza" theme song was not on the list and a little ditty called "Washington Square" by the Village Stompers also missed this list. I was surprised. I tend to agree with the survey though. 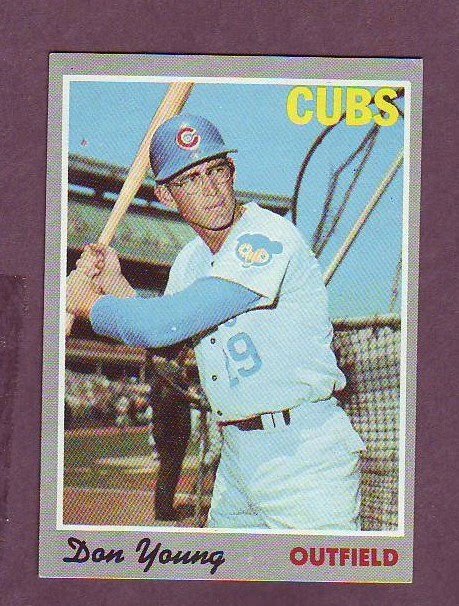 Thanks again and I love Santo and Johnny's Sleep Walk too as my all time favorite instrumental. As a very young DJ, I once commented on the air that our station was playing "the greatest hits of all time." After the broadcast, the GM came up to me with a grin and said, "All time, eh? So tell me. How many hits of the '40s do we play?" I felt like an idiot -- because of course there were none. We were NOT really playing "the greatest hits of all time." We weren't even playing the greatest hits of our OWN time (in all musical categories). We were playing a selection of the greatest pop and rock hits of the past 20 to 25 years. From that point on, I have always been very careful to not overstate but instead accurately billboard things with a precision which adds clarity and credibility. As an example, while programming oldies at KRLA, I came up with the station slogan "The Heart and Soul of Rock 'n' Roll." That accurately described our programming -- and was a phrase I later reused when titling a CD box set. It is always so patently absurd when someone slaps "all-time" status on a group of anythings all pulled out of the very same narrow time frame. 1955-1979 is hardly "all time." By that criteria, one could make up a list of "The World's Largest Selling Albums Of All Time -- but quietly restrict it to only those issued between February and June of 1962 in Bulgaria. The fact is, "all time" is all time. It's not 1955 to 1979 -- no matter how myoptic one's view of history might be. We don't want our kids to be oblivious to the music of OUR time -- the rock era. So why should we turn a deaf ear to hits prior to 1955? Should our kids, in turn, turn a deaf ear to music prior to 2005? b) "The Favorite Top 50 1955-79 Instrumentals of Forgotten Hits Readers" (as of November 2009). What I find interesting is that Artie says the originally posted version posted was done for the stereo mix of the album ... if I recall correctly, the rest of the album is true stereo while Midnight Mary was rechanneled. The one you originally posted was mono and matches how my 45 sounds, so it's no wonder they'd use a rechanneled version of the single mix for the album while leaving the rest of the album fillers in true stereo (this was common in the 60's). The version David posted is definitely from the same session and may even be an undubbed take from the same take as the hit, but is still mono anyway. There's a person named Mark Mathews who takes undubbed mixes and sometimes alternate takes and can create stereo 45 versions of songs by syncing up tracks in separate channels and doing whatever he does to extract any audio that would make it not sound like a 45 version. One of the tracks he tackled was Midnight Mary and he took the undubbed take and had it coming through one channel and had the full mono single and had it coming through the other. I liked how it sounded but without being able to access my own computer at the moment, I can only go by memory that the vocal from the undubbed take didn't quite match up with the full mono version. Why the alternate version exists is that it is likely that Larry Uttal held on to the session tape after Artie turned the song over to him for Amy Records, or as Artie says, maybe it was meant to be used for the album but kept off in place of the actual hit version. After experiencing exhaustion and falling asleep often on late night cab trips from Manhattan to the Bronx, I obviously confused the trip I wrote about with one that happened at a later time. Hope you and all the members of the class of Forgotten Hits had a great Thanksgiving weekend! Congratulations on your tenth anniversary of providing news and information about the greatest era in pop music to your legions of loyal fans! I am SO EXCITED to see the highly anticipated list of instrumental favorites! Many of my own fave raves were in the list, and I can't wait to download and listen to the podcast of Phil Nee's countdown show! Speaking of instrumentals, part one of TRIALS AND TRUBULATIONS OF A SURF MUSIC LEGEND is now complete and ready to debut on the FORGOTTEN HITS blog, as soon as you have an opening to post it! It's written from the viewpoint of MERRELL FANKHAUSER, the writer of the original version of the surf instrumental classic WIPE OUT, released by THE IMPACTS in the fall of 1962. It really is a great story and I'm sure will be of interest to anyone in the FH class who are fans of the surf music scene of the early sixties! In the meantime, I've already alerted you and the FH family about the stories I've posted about my friend of many years, RUSS TERRANA. He's the true "unsung hero" of Motown Records, who mixed NEARLY HALF of the label's #1 records and hundreds of other charted singles and album cuts during his decades-long career that lasted to the very end of Berry Gordy's reign on the label! I had promised to post a comprehensive feature story documenting his storied career and, with the recent release of the new JACKSON 5 album I WANT YOU BACK! UNRELEASED MASTERS, I decided this was the time to release this previously untold story! PART ONE of BEHIND THE MOTOWN MIXING BOARD TIEH RUSS TERRANA is now online! It's a fresh, new read on the story behind the Motown hits of the sixties, seventies and eighties and loaded with lots of stuff that's never been published before! Part One of this fascinating story is online now at my company blog, and can be accessed directly here! Happy Holidays to all and, as usual, STAY TUNED! Read the HyLitRadio November 29th Newsletter here. Allison Martino has her own youtube channel ... and it includes a nice video photo collage to her father Al's song, "Daddy's Little Girl." I love it. I think Green Eyed Lady by Sugarloaf had a shortened single version. The long 6:51 version had only 1:36 of vocals. Other than that, and In-A-Gadda-Da-Vida, do you know any other songs which have such a low portion of vocals? There were shortened singles versions, but it was a myth that singles had to be 2:30 or less, which lasted until at least 1969. Did Susie Q have a shortened version? I just found out recently that 45s cannot hold over about 7:00 of music on each side. That is why American Pie was on two sides. Maybe you can pass along my Happy Birthday wishes to Freddie " Boom - Boom " Cannon. His Birthday is Friday, December 4th. Thanks for all the great music. Keep rockin'. THANK YOU FOR REMEMBERING! WE WON'T STOP ROCKIN'! And The Hits Just Keep On Comin'!! !